Come and study at RTA! Study process issues – lecture schedules, lecture attendance, truancy, extension of academic sessions, academic debts, change of study and personal data, academic leave, etc. issues related to the study process. Lecturer: Iveta Dembovska, Historic building, Room 220. Professional Higher Education Master's Study Program "Computer Systems"
Master's study program "Electronic Commerce Information Systems"
Sports, Choir, Dance, Theater, Excursions, etc. Bachelor's Study Program "Management Science"
Master's Study Program "Management Science"
Master study program "Laser Technology"
24 AprStudent Scientific Conference "Personality. Time. Communication." 18 MayConference "Individual. Society. State." 20 JunGraduation Ceremony. Faculty of Economics and Management. 21 JunGraduation Ceremony. Faculty of Education, Languages, and Design. 28 JunGraduation Ceremony. Faculty of Engineering. 17.04.2019. Student, apply for Daugavpils Half Marathon! 22.05.2018. Join AAB International Summer Academy! 15.05.2018. 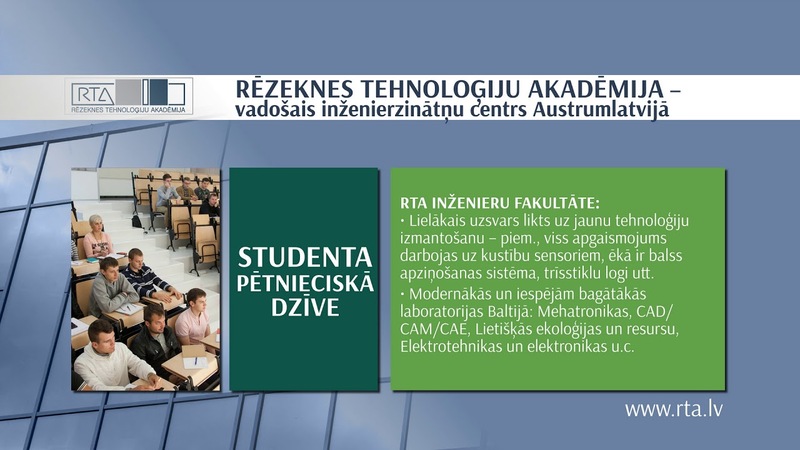 Research Institute for Regional Studies (REGI) of Rezekne Academy of Technologies invites authors to submit papers for the collection of scientific papers "Education Reform in Comprehensive School: Education Content Research and Implementation Problems I, 2018".